It was about 2 years ago that Silver Bullet first came to Musicalypse’ attention, as both Hannes Horma and Nils Nordling contributed to our Playlist of My Life series. We then went to see them perform opening for Blaze Bayley at On the Rocks. As such, when the announcements started coming regarding a new album to be released in March 2019, we were happy to start listening and see where this promising new band was headed. 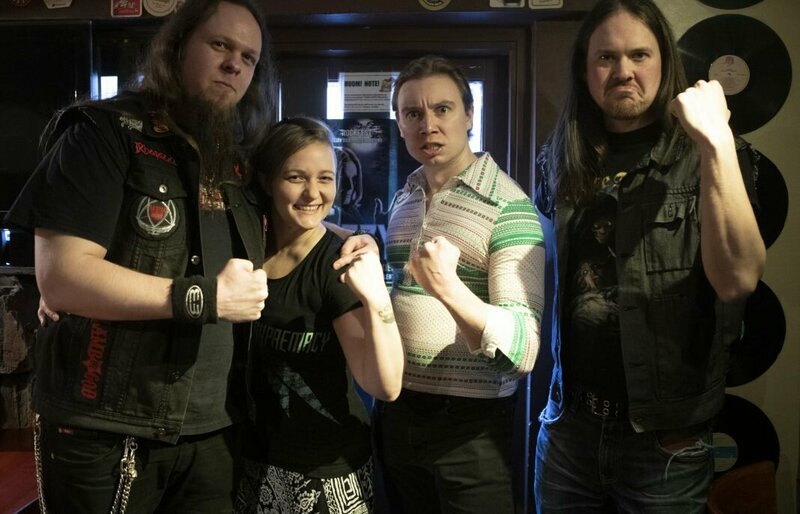 We met up with Hannes Horma and Henri Asikainen on March 1st, 2019, at Majava Baari in Helsinki to discuss who these guys are, where they’ve come from, and most importantly, what their music is founded on! Hello! It’s great to be talking to you at long last. How is everything going right now? 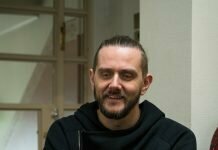 Hannes: The album is done and we are doing a lot of promotion, like this interview. So it’s really good. Congratulation on the upcoming release. Is your partnership with Reaper Entertainment a new thing? Hannes: It’s new. We had a deal with the first album with 7Hard for one record, so when we released [Screamworks] we had to find a new one. We found Reaper and have a 2-record deal with them. Before we get started talking about the album, tell me a bit about how Silver Bullet formed, since you’re still a bit of a fresh face on the scene. Did you know each other beforehand or were you all strangers? Hannes: No, we didn’t know each other at all. Henri: It started in 2008. 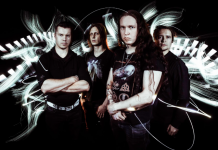 There’s a Finnish site where you can search for other musicians. Our former singer, Jani, had added there that he was searching for members for his band. I don’t actually remember what kind of a band it was. Something like Kamelot in the style, which caught my attention. We had all the members very fast, which was weird because Riihimäki is a small town and everybody was from there. So we started really small, rehearsed, and the guy who put the band together knew Hannes from somewhere. 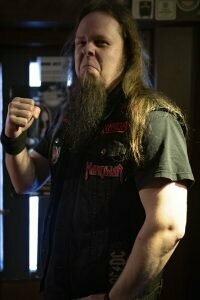 Hannes: We played in a cover metal band… almost 20 years ago [laughs]. Henri: So he came along with all his ideas and it progressed. Hannes: We made a few EPs and then we had some shows, and then we did a Nummirock show. Then Jani left the band and we found Nils, and then we changed our name and made Screamworks. 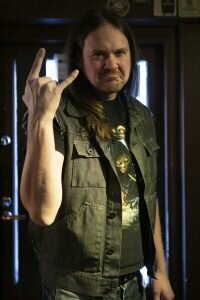 You [Hannes] played bass in Turisas – how do you like being on guitar now? Hannes: Exactly. Then then next day, “We have a rehearsal.” Okay! [laughter] So I bought a bass and that’s about it. Do you still play bass nowadays? Hannes: Yeah, I actually played the bass on the album, because Markus left the band before we recorded and Ossi [Elonen] came a bit too late [laughs]. The new album is called Mooncult – is it safe to assume that this is a concept album? Henri: Yes, definitely it is. As we were listening, I got a vampire-story feel from it, while one of my other reviewers felt like it was very lycanthropic, and now after reading through the lyrics, it seems like it’s actually about witchcraft. That in mind, what is the actual basis for the story? Hannes: The story started with the theme of witch hunts. Basically the main idea was about witch hunts in a town or city and the town used the witch hunts to oppress the people for their perverted ambitions [laughter] and stuff like that, so that was the main idea. Then Nils did some research on the subject and found out about some witch hunts that happened in Scotland. We took that idea and gave it a little spice with our own theme. You gave it your own interpretation? Henri: The story is true, but we have the fictional element to it. Obviously there is something supernatural going on, some creature corrupting someone as her follower? Hannes: Yeah, it’s the goddess Hecate as one of the elements in the story. She’s the one with the promise in the first song. That’s something that we added to the story that’s not real [laughter], obviously. Also we added the Mooncult in there to make it even more of a horror story. But it’s basically a story where the main character, Thomas, loses his wife and son in an accident in the beginning and then he starts to lose his mind over it. The girl who is sacrificed at the stake is his daughter. It’s a bit complicated. So he’s getting involved with supernatural forces for vengeance, or…? Hannes: He’s looking for an answer to bring his wife and son back and Hecate is the one answering. Henri: It’s a story about witchcraft. Towards the end, Thomas seems to be second-guessing his choices. How does that play out? In the last few songs he still seems to be fighting on the supernatural side, but he doesn’t seem quite so okay with what he’s doing. Hannes: Actually, the last song is about how Hecate has been fooling him all along, so he loses everything in the story and ends his life. It’s not a happy story [laughter]. “Lady of Lies” is another song about Hecate and the fact that she is lying. Perfect, I love hearing stories like this told through music. At this moment in time, what are your favorite songs from the album? Henri: I’d have to say “Eternity in Hell.” It’s my favorite from the album. Hannes: For me it’s really hard because I’ve heard them like five hundred times already, but I think “She Holds the Greatest Promise” is maybe the best to show the sound of the album, so maybe that. “Eternity in Hell” is also my favorite, for interest’s sake. Henri: It has a great chorus, doesn’t it? It really does. I can’t wait to hear it live. And this album has so many more musical elements to it. There’s the power metal, the orchestrations, the thrashy power metal drums – there are so many different styles in there. Did you need to tone any ideas down or did you go full-force into it? Hannes: Not really. When we made Screamworks, we both composed the songs and it was a collection of songs, nothing focused or with a purpose. But with Mooncult we had to make it a bit different because it’s a concept album and I made most of the songs this time. Henri: All of the songs. Hannes: [laughter] Okay yeah. So I had to compose for the story. I just went on with the feelings that I had in the story and wrote the songs. So the story came first and the music followed? Hannes: Yes, it was kind of a combination of both, but we had the structure of the story first. Henri: We also had a few songs ready. Hannes: Yeah, but it was kind of a combination of both. “Eternity in Hell” was, I think, the first song that was ready, but we didn’t know where to put it at that time. Then came “Burn the Witch” and that basically opened the story up. So we knew that “Burn the Witch” is going to be at this point of the story and then we started to build it up. Musically speaking, you’ve really done a great job of capturing this horror aesthetic in the soundscape. How did you manage that? Hannes: There are so many things that make it. Of course the basic song structure and the riffs and the melodies, but also the orchestrations. That’s a big part of that. If you strip all of that away, some of the songs sound pretty basic, actually [laughter]. But it’s something that masks the sound a bit if you make a lot of orchestration. It brings a kind of mood. Will you be having an album release show for Mooncult? Hannes: Yes, it will be in Hämeenlinna, the same day the album is going to be released [May 29th, 2019]. Let’s talk about your live shows then. When we saw you guys opening for Blaze Bayley, you had the costumes, the stage props, the extra performers doing all this crazy stuff… are you going to continue with that theatrical style? Hannes: Yeah, we had a great response from it. We always have had a great response from it. I think we’ll do it, but we have to think about it more now because it has to fit the album somehow. Of course we’ll do a few songs from the first album. Do you think that the outfits might change from album-to-album? Hannes: I am sure of it. Do you have someone who makes your outfits, or do you make them yourselves? Hannes: It’s a bit of a combination. Some of the costumes are custom made, but most of it is bought online or from our own stuff. At that same show, I remember there being a somewhat awkward moment after one of the performers did a striptease. Did any of you guys notice that on stage or hear about it after? Henri: [laughter] I heard about it, but I didn’t see it. Hannes: I didn’t see it either, but I think the main problem with the On the Rocks show was that there was no entrance to the back of the stage, so the actors had to really hurry not to miss their queues on the songs. That was one of the problems. Then when we have costume changes and stuff like that, sometimes it doesn’t work as well as it should [laughter]. So I think that was one of the problems. I didn’t see it because it happened behind me. Henri: It wasn’t planned in any way. So was she just in a hurry to get to change and get back out? Hannes: I think it was something like that. I’m not really sure actually [laughs]. You’ve always got to have these fun little moments to look back on to make the shows memorable. Hannes: [laughter] Yeah, when there are so many people on stage and so many things happening, there’s always going to be something going wrong. I think that we never take it too seriously with the show elements, because we don’t have a budget like Alice Cooper, so we make it look cool but we want to have fun. Henri: Tongue-in-cheek in a way, always, because you can’t do that with a straight face. Is that a goal you would strive for, to get to Alice Cooper’s level of stage show? Henri: I think it’s a bit too much. Hannes: Maybe a bit too much. Maybe there would be some things that are similar that we’d like to do, but it’s not going to be on every song. Two or three things and making it well. Adding a little extra spice to the show? On that note, what are some of your goals with the band right now? What are you hoping to achieve with this? 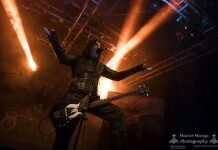 Hannes: Touring in Europe is the main focus at the moment. And of course, selling a lot of records [laughter]. How much have you gotten out on the road with Silver Bullet so far? Have you done many live shows beyond the one we saw? Hannes: We have done quite a lot of live shows but not a lot of touring. All in Finland and the Baltic. So we hope to go to Europe now. Hannes: Yeah, Germany is our focus. Of course, you always have to get to Germany, and then Japan. Hannes: We actually made a record deal in Japan as well. Henri: A few days ago. Congratulations! Hopefully we’ll hear about some shows in Japan coming up in the future? How did you [Hannes] like it there? Hannes: It’s cool. I’m a giant there [laughter]. My last question then, is that one of the quirkier – let’s call him – guys on my review team had an interesting way of describing your album after we listened to it: “gently vibrating aggression.” What do you think of this description of the music? Hannes: [laughter] I don’t know if it’s gentle in any way. I won’t put words in his mouth, but I’d say that the “gentle” part came from the smooth flow of the album. Henri: Maybe the vocals are not as hard as many of the metal bands these days, so that’s also a reason it could be gentle. Hannes: That’s cool [laughs]. We had a lot of different views on the music we are doing, so it’s always good to hear that people have gotten some kind of feeling from it. Well thank you so much for talking with us. Now for the worst question, as always: any last words for the readers?